My love life. Can we even call it ‘love’ at this point? We should describe it as my heartbreak train-wreck life. It seems no matter what I do there is something dragging my sprits down. And by something, I mean someone. But really do I have anyone to blame but myself for all this heartache? I feel like no matter what I do I end up either hurting someone or getting hurt. Ugh. I know that’s all super vague but I’m not going to focus this review on my sorrows. I want to be distracted away from my feelings, so I might as well take another scoop of MAN Game Day and start REALLY giving you some good, hard intel on this pre workout. What’s the Best Flavor of MAN Gameday? Tropic Fury: This flavor is funny because it reminds me of that movie tropic thunder. Tropic Thunder is actually not THAT funny in my opinion but still the premise is hilarious and whenever I read ‘Tropic Fury’ I still crack a smile. This flavor is essentially a sour pineapple flavored pre workout with maybe some notes of mango or something. But the overwhelming flavor in Game Day is certainly the pineapple. The strength of this flavor lies in the fact that their is a great deal of sourness to balance out the sweetness. If you take two scoops, this product is QUITE sweet. So I should throw that out there. Same goes for the second flavor that I tried- the Classic Fruit Punch. Classic Fruit Punch: I don’t know how many more times I can try this flavor before I am sick of it. I feel like the last fifty-thousand pre workouts I’ve tried have been fruit punch flavored. Hm. That’s impossible since I haven’t tried anywhere near that many pre workouts. I mean. Nobody has tried that many pre workouts, have they? I hope not. But yeah. this interpretation of the classic fruit punch is just about as classic as it gets. This product tastes exactly like Hawaiian Punch sugar-y drink from when you were a kid. Maybe a touch more sour, but pretty darn close to that. Once again MAN Sports is going to get an ‘A’ on a grading criteria for Game Day’s performance grade. There is just something really special about the FOCUS that you get from this pre workout that I honestly haven’t experienced since the original ‘CRAZE’ pre workout of the yesteryear. If you remember Craze, you remember that product had dendrobium, and maybe even some AMP Citrate in it. Neither of those additions were particularly healthy. But what they did do was dial in your energy and focus to an impressive level. This pre workout reminds me of that. The workouts that I’ve been doing in the recent weeks have been incredibly tame by most people’s standards. I’ve been doing all kinds of lunge holds, wall-sits, hamstring holds, and other pretty low impact styles of exercise. I’ve had some pretty marked joint issues as of late, and realized that I really had to dial back the intensity of what I was doing. But when I’m doing these new ‘hold’ style workouts, it can be hard to dial in the focus. And that’s where Game Day has helped significantly. I took a scoop and a half this morning, and was able to hold my poses for way longer than usual without feeling the mental doubt start to creep in. This product not only improves the focus of the user but also the stamina. I really truly feel like I can go for longer without getting tired when I take Game Day pre workout. It’s especially noticeable when doing one of these isometric style workouts. The last performance element that is upgraded each time you take GAME Day is the PUMP. I know, ladies. We don’t always need that ‘swole’ feeling. Like. Almost never. But when you do decide to do some resistance training with Game Day pre workout, you will feel a really nice ‘pumped up’ tightness in your muscles that gives me a little bit of an adrenaline rush when I look in the mirror. It doesn’t last long, but it’s still a really cool effect. It’s not as dramatic as when you take White Rapids or some of the other ‘Crazy Pump’ products that I’ve experienced, but it’s still pretty cool. Ok let’s talk about the formula. Wow. Three grading sections, three ‘A’s. I think we might have a winner on our hands folks! Now. I’m not saying that this is necessarily the best pre workout for women winner of 2016, but I can certainly see it holding a top five spot when we release those rankings in January! 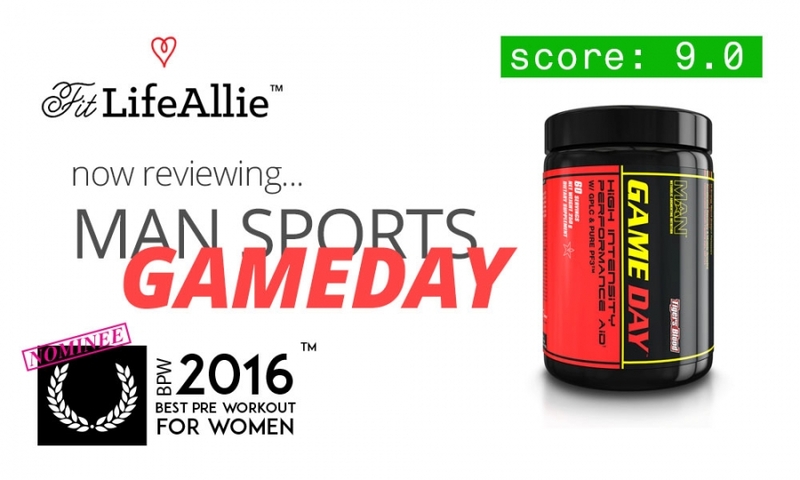 Can Women Take MAN Game Day Pre Workout? The answer to this is a resounding ‘yes’ in my humble opinion. MAN Sports’ pre workout seems to be intended more for men than women, but there doesn’t seem to be anything about the product that would eliminate it from the option list. And. Hey. I’m still alive after taking it. Soo. Lol. Yeah you should be fine. Just start with a half scoop and work your way up to psycho-status. This might be the first pre workout that I’ve ever given the same exact score to every element of the product. I am comfortable giving an ‘A’ to this product on the packaging because the design matches the products results so closely that the whole entire thing just feels seamless from beginning to end. From the moment you grab it off the shelf to the moment the final results of the pre workout wear off, you get the feeling that this is a pre workout that was designed very comprehensively. The black background is the right choice to frame yellow and red tones of the product. There is heavy red influence on this package that echoes the seriousness of the pre workout product within. MAN Sports designers have done a nice job of giving you the right information in the right hierarchy. The title ‘Game Day’ title is yellow and red, and drives vertically down the side of the jar. The subtitle ‘High Intensity Performance Aid is also a very accurate description of what this product does. The ‘MAN Sports’ logo is a little too ‘energy-drink’ looking for me, but I think it’s working for them. The last thing that they’ve done well is use handsome flavor graphics. They might consider adding more visual cues like actual images of the fruits and stuff, but overall it’s not bad. Review: MAN Sports Clean Protein: Is it really THAT Clean?